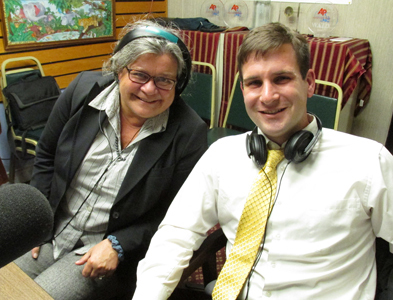 Former WBET/WCAV reporter Betsy Zulus Clague and Alex Bloom are guests during this special post debate discussion on Monday Night Talk! Betsy and Alex analyze the Brockton Mayoral Debate between Mayor Bill Carpenter and Chris MacMillan, which was held at Massasoit's Buckley Performing Arts Center! Do you have an topic for a future show or info on an upcoming community event? Email us at mondaynighttalk@gmail.com or "like" and post a comment on our Facebook page: www.facebook.com/mondaynighttalkon959fmwatd. If you're a fan of the show and enjoy our segments, you can either download your favorite segment from this site or subscribe to our podcasts through iTunes today! © Monday Night Talk with Kevin Tocci - 2015. Unauthorized use and/or duplication of this material without express and written permission from the show host and/or owner is strictly prohibited. Mayor Bill Carpenter and challenger Chris MacMillan participate in a media debate at Massasoit's Buckley Performing Arts Center, which was broadcast on Monday Night Talk! WATD Managing Editor Christine James serves as moderator, as WATD's Charles Matthewson, Mark Linde from Brockton Community Access, The Spark's Emily Reynolds and Ed Donga with the Enterprise pose questions to the candidates. Do you have an topic for a future show or info on an upcoming community event? Email us at mondaynighttalk@gmail.com or "like" and post a comment on our Facebook page: www.facebook.com/mondaynighttalkon959fmwatd. If you're a fan of the show and enjoy our segments, you can either download your favorite segment from this site or subscribe to our podcasts through iTunes today! © Monday Night Talk with Kevin Tocci - 2015. Unauthorized use and/or duplication of this material without express and written permission from the show host and/or owner is strictly prohibited. Plymouth County Commissioner Greg Hanley is a guest during this segment of Monday Night Talk! 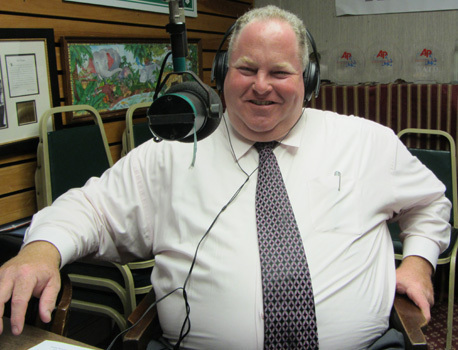 Greg discusses the latest with county and his campaign to seek a second term in office Do you have an topic for a future show or info on an upcoming community event? Email us at mondaynighttalk@gmail.com or "like" and post a comment on our Facebook page: www.facebook.com/mondaynighttalkon959fmwatd. If you're a fan of the show and enjoy our segments, you can either download your favorite segment from this site or subscribe to our podcasts through iTunes today! © Monday Night Talk with Kevin Tocci - 2015. Unauthorized use and/or duplication of this material without express and written permission from the show host and/or owner is strictly prohibited. 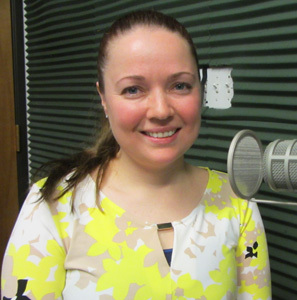 Anna Grace Raduc, a State Senate candidate is a guest on Monday Night Talk! Anna discusses her decision to run for the open State Senate 2nd Plymouth Bristol seat, what the challenges will be in the race. If you want to learn more about Anna's campaign for State Senate, then visit her Facebook page; https://www.facebook.com/annagraceraducforstatesenate?fref=nf Do you have an topic for a future show or info on an upcoming community event? Email us at mondaynighttalk@gmail.com or "like" and post a comment on our Facebook page: www.facebook.com/mondaynighttalkon959fmwatd. If you're a fan of the show and enjoy our segments, you can either download your favorite segment from this site or subscribe to our podcasts through iTunes today! © Monday Night Talk with Kevin Tocci - 2015. Unauthorized use and/or duplication of this material without express and written permission from the show host and/or owner is strictly prohibited. 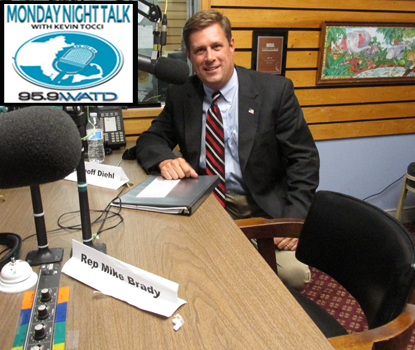 A Weymouth Mayoral Debate with Mayor Sue Kay and State Senator Bob Hedlund is featured on this segment of Monday Night Talk! WATD Managing Editor Christine James serves as moderator, as Kevin Tocci and Charles Matthewson pose questions to the candidates. Do you have an topic for a future show or info on an upcoming community event? Email us at mondaynighttalk@gmail.com or "like" and post a comment on our Facebook page: www.facebook.com/mondaynighttalkon959fmwatd. If you're a fan of the show and enjoy our segments, you can either download your favorite segment from this site or subscribe to our podcasts through iTunes today! © Monday Night Talk with Kevin Tocci - 2015. Unauthorized use and/or duplication of this material without express and written permission from the show host and/or owner is strictly prohibited. 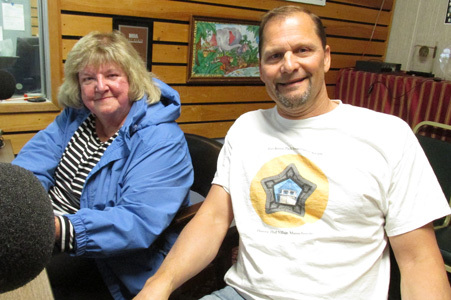 Ellen Spadorcia and Jamie Becker from Hingham Civic Music Theatre are special guests on this episode of Monday Night Talk! 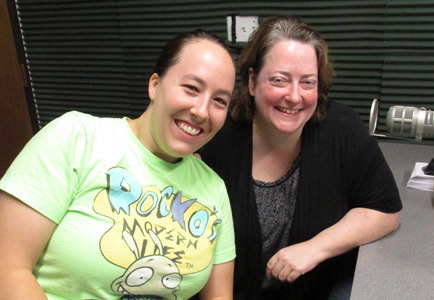 Ellen, the HCMT Board president and Jamie Becker stop by the show to share details of the theatre's company's latest production of Young Frankenstein. Both Spadorcia and Becker have roles in this musical which recently opened up for two weekends. Performances are held at the Sanborn Auditorium, on the second floor of Hingham Town Hall on 210 Central Street in Hingham. For more info, visit their website; hcmt.org/. Do you have an topic for a future show or info on an upcoming community event? Email us at mondaynighttalk@gmail.com or "like" and post a comment on our Facebook page: www.facebook.com/mondaynighttalkon959fmwatd. If you're a fan of the show and enjoy our segments, you can either download your favorite segment from this site or subscribe to our podcasts through iTunes today! © Monday Night Talk with Kevin Tocci - 2015. Unauthorized use and/or duplication of this material without express and written permission from the show host and/or owner is strictly prohibited. William Phelan, former Quincy mayor and mayoral candidate is a guest during this segment of Monday Night Talk. 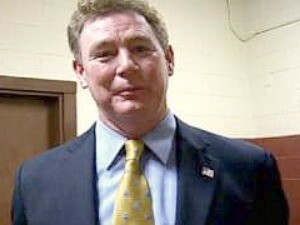 Bill calls into the show to discuss why he's seeking office again and what the issue in the race. To learn more about Bill's campaign for office, visit his website; www.phelanformayor.org/. Do you have an topic for a future show or info on an upcoming community event? Email us at mondaynighttalk@gmail.com or "like" and post a comment on our Facebook page: www.facebook.com/mondaynighttalkon959fmwatd. If you're a fan of the show and enjoy our segments, you can either download your favorite segment from this site or subscribe to our podcasts through iTunes today! © Monday Night Talk with Kevin Tocci - 2015. Unauthorized use and/or duplication of this material without express and written permission from the show host and/or owner is strictly prohibited. 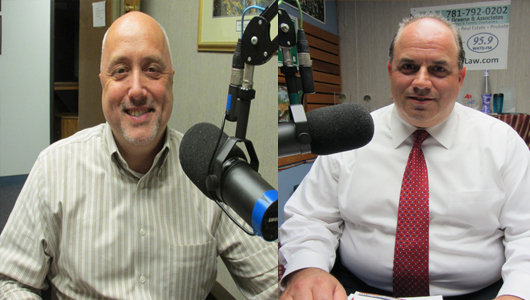 Monday Night Talk hosts a political forum with the candidates running in the 2nd Plymouth Bristol State Senate race! 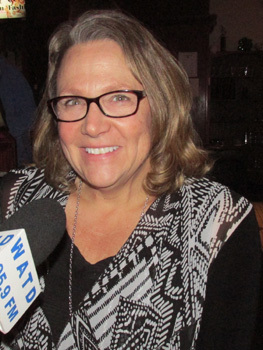 The forum was moderated by WATD's Managing Editor Christine James with questions posed by station reporters Kevin Tocci and Charles Matthewson. The three candidate who are on the ballot; State Representative Mike Brady (D), State Representative Geoff Diehl (R) and Anna Grace Raduc (I) were each invited to attend the taping of this debate which aired later that night. Unfortunately, only one candidate managed to participate in the debate. Do you have an topic for a future show or info on an upcoming community event? Email us at mondaynighttalk@gmail.com or "like" and post a comment on our Facebook page: www.facebook.com/mondaynighttalkon959fmwatd. If you're a fan of the show and enjoy our segments, you can either download your favorite segment from this site or subscribe to our podcasts through iTunes today! © Monday Night Talk with Kevin Tocci - 2015. Unauthorized use and/or duplication of this material without express and written permission from the show host and/or owner is strictly prohibited. 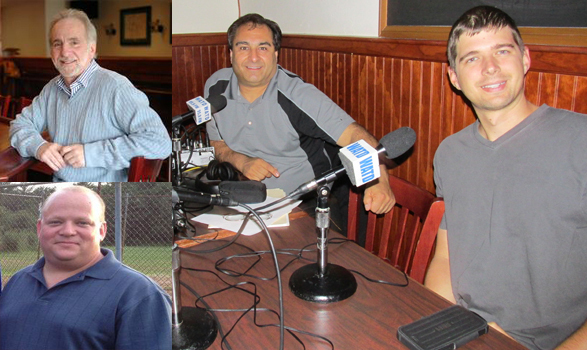 Monday Night Talk is broadcasting live at McGuiggan's Pub in Whitman MA during this segment that features pub owner Richard Rosen and Fire Chief Tim Grenno! Richard and Tim discuss the restaurant along with the many events that take place at McGuiggan's. There's also a cameo by WBZ radio host and trivia guru Morgan White Jr!!! Do you have an topic for a future show or info on an upcoming community event? Email us at mondaynighttalk@gmail.com or "like" and post a comment on our Facebook page: www.facebook.com/mondaynighttalkon959fmwatd. If you're a fan of the show and enjoy our segments, you can either download your favorite segment from this site or subscribe to our podcasts through iTunes today! © Monday Night Talk with Kevin Tocci - 2015. Unauthorized use and/or duplication of this material without express and written permission from the show host and/or owner is strictly prohibited. Monday Night Talk is broadcasting live at McGuiggan's Pub in Whitman MA during this segment that features former State Representative, State Treasurer and 2002 Gubernatorial candidate Shannon O'Brien! Shannon joins Kevin Tocci and Joe Rossi to look at the 2016 Presidential Democratic field, who could receive the party nomination and which Republican could eventually face. Do you have an topic for a future show or info on an upcoming community event? Email us at mondaynighttalk@gmail.com or "like" and post a comment on our Facebook page: www.facebook.com/mondaynighttalkon959fmwatd. If you're a fan of the show and enjoy our segments, you can either download your favorite segment from this site or subscribe to our podcasts through iTunes today! © Monday Night Talk with Kevin Tocci - 2015. Unauthorized use and/or duplication of this material without express and written permission from the show host and/or owner is strictly prohibited.